Located in the historic Chicago and West Michigan railroad depot on Petoskey's waterfront, the Little Traverse History Museum is a gem--a history filled gem. The museum's three main exhibits--Ernest Hemingway, Faces and Places that Shaped Emmet County, and the Parlor Exhibit--outline the area's history. And what a history it has been! 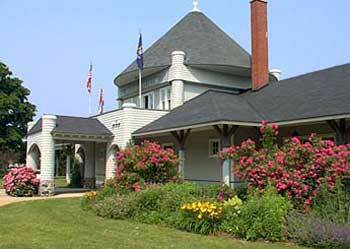 Ernest Hemingway is a part of Petoskey's history having lived here and on nearby Walloon Lake. The Hemingway exhibit at the museum includes pictures, artifacts, and heirlooms. Hemingway fans love to visit Northern Michigan and love this exhibit. This beautiful museum is located just a Petoskey stone's throw from the marina. The Bayfront Park surrounds the museum and this park is the site for the annual Historic Festival & Taste of the North, held this year June 15. The history of the Petoskey area is captured in this museum. Petoskey was named after Chief Neyas Petosega. Born in Middle Village, north of Harbor Springs, he moved to the area near the Bear River (just outside the museum's front door) where he raised his sons. The family became prominent land and business owners and the city became known as Petoskey in in 1873 after the Chief.